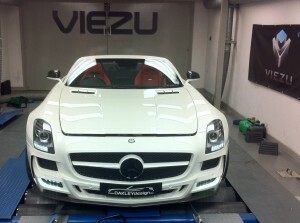 The Mercedes SLS AMG Tuning and the Mercedes SLS ECU Remapping at Viezu. The Mercedes Benz SLS AMG is a rare beast of a car, and the Mercedes SLS is truly very rare and a very special car. The Mercedes Benz SLS AMG has all of the engineering and design details that make Mercedes Benz one of the top marques in the automotive world. With perfectly engineered components and a ruthless German efficiency and drive for perfection, the Mercedes Benz SLS AMG automotive mirror to Viezu Technologies. With a desire and drive to obtain perfection in everything we do from our Blue Optimize fuel economy tuning through to an all-out performance remap, perfection is our goal in every aspect of what we do here at Viezu. To this end, what better time to show case our ruthless dedication to our development, than to bring to you our latest and some might say greatest performance tune to date. Tuning the Mercedes Benz SLS AMG! The Mercedes SLS Roadster is an animal of a car. Running a temperature corrected 425hp at the wheels in stock form, with 367ft lbs of torque. Here at Viezu we saw this as a car that could be improved further with some delicate ecu remapping. The Mercedes Benz SLS AMG Tuning In less than 1 hour from the point of removing the ECU to having the map data analysed and optimized, we had the Mercedes Benz SLS AMG ECU back in the car and ready to show its new potential. The customer and the staff watching the Mercedes SLS Roadster on the dyno were unaware of what was about to happen. The new Viezu / Mercedes Benz SLS AMG SLS Roadster remap had transformed this already formidable vehicle.